(November 29, 2018) – There is a new and growing threat to the world’s forests, people and climate: the biomass energy industry, touted as a ‘renewable’ energy. The use of forest biomass as a source of ‘green energy’ is set to increase by a staggering 250% over the next decade, having already doubled in the previous ten years, according to research published today by the Environmental Paper Network (EPN). The growth is being encouraged despite scientists discrediting the climate benefits and civil society raising alarms about the threat it poses to the world’s forests and their inhabitants. The EPN’s new report “Are Forests the New Coal? 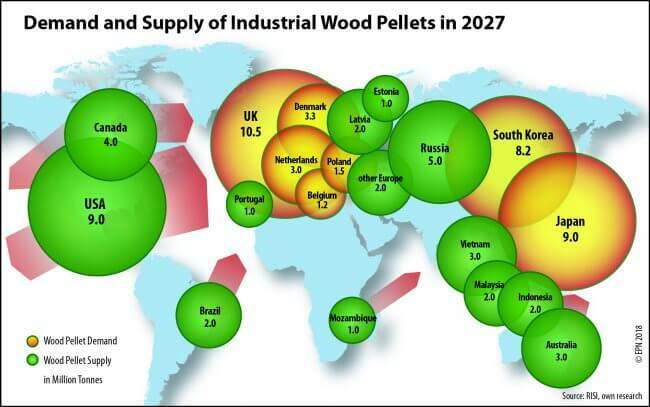 A Global Threat Map of Biomass Energy Development” finds that Japan and South Korea are emerging centers for forest biomass energy consumption. They are emulating European policies which subsidize the burning of wood for energy, but fail to count the resulting smokestack carbon emissions. “Countries at the upcoming UN Climate Conference need to urgently fix the broken policies which escalate logging and the burning of forests. They need to ensure that the Paris Agreement rule book closes the loopholes which allow the huge emissions from wood combustion to go unaccounted,” said Ms. Peg Putt, Coordinator of the EPN’s Working Group on Forests, Climate and Biomass. Despite the controversies, bioenergy dominates ‘renewable’ energy production in the Organization for Economic Cooperation and Development (OECD), dwarfing wind and solar and soaking up subsidies that should be applied to these genuinely low emissions technologies. Although burning wood is more emissive than burning coal per unit of energy produced, flawed carbon accounting methods set the emissions from wood burning at zero in the energy sector. This has spurred massive expansion. “The Intergovernmental Panel on Climate Change is clear that to tackle climate change we have to urgently protect and restore forests. Subsidizing bioenergy increases deforestation and forest degradation and takes money away from low emissions technology like wind and solar. Even if damaged forests are allowed to grow back, it will happen way too late to reduce the climate disaster”, added Ms. Garson.